See? Told you I’d post two projects this week to make up for missing one last week. 😉 One of my July project goals was to spruce up our master bathroom a bit and I decided it would be a good place to start a gallery wall. I love me some gallery walls, and this isn’t the first one in my house. The best part is they can be a really rotating/evolving space. So while I like the impact our new gallery wall makes to the space above our tub, I also know I’ll be tweaking it from now til eternity as I find things to swap out and add. But for now, this project cost me nearly nothing and it’s a big improvement from the previously blank wall. Frames/mats: The teal frame was purchased for $.50 during my thrift haul a couple weeks ago. I painted it with leftover paint (from our bedroom walls). The rest of the frames, I scored during the stuff swap I hosted at my house in June of this year. They held lots of random prints I cut away from the existing mats and I spray-painted them with leftover ORB spray paint from this project. That means all six frames cost a total of $.50. 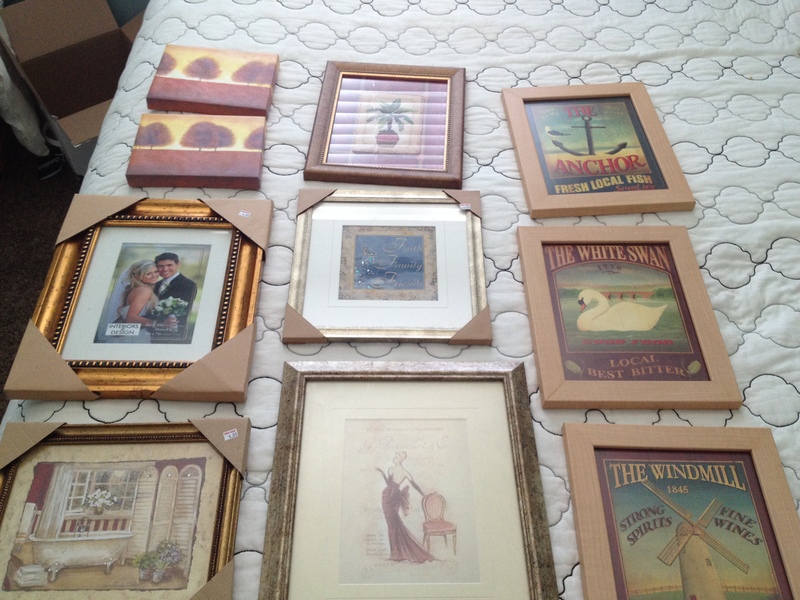 Here’s the collection of frames pre-decontruction (I didn’t use the canvases or the three on the far right.. I will be doing something with them soon!). Prints: The botanical prints in the frames were all cut from a book I picked up at a flea market last summer. I liked that the prints were a little mod and had planned to do some decoupage with them, but found it again when I was deciding what to fill frames with for this gallery wall. There are still plenty of prints left for another project. I couldn’t have spent more than $5 on the book – I’m guessing less. Total of $5.50? Yeah, that’s practically free, right? In real life the gallery wall looks bolder- I just can’t seem to capture that! But this is only a start. 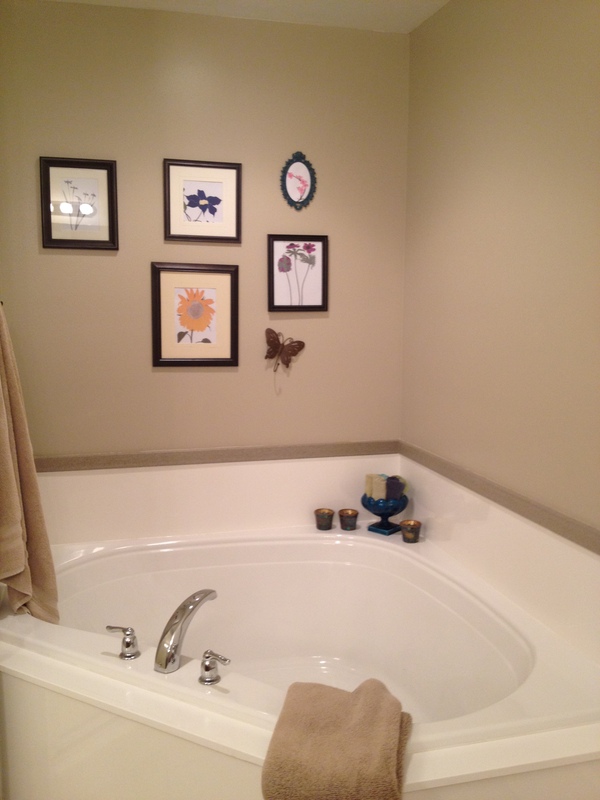 I do plan to add more framed art in larger frames, maybe a mirror, and some other non-framed objects to this wall, all of which I will move around the corner to span the entire space above the tub. But since the hardest part is getting started I’m happy to make some progress on this little project. I am madly in love with gallery walls. They are seriously my favorite thing ever and they can be found all around my house. 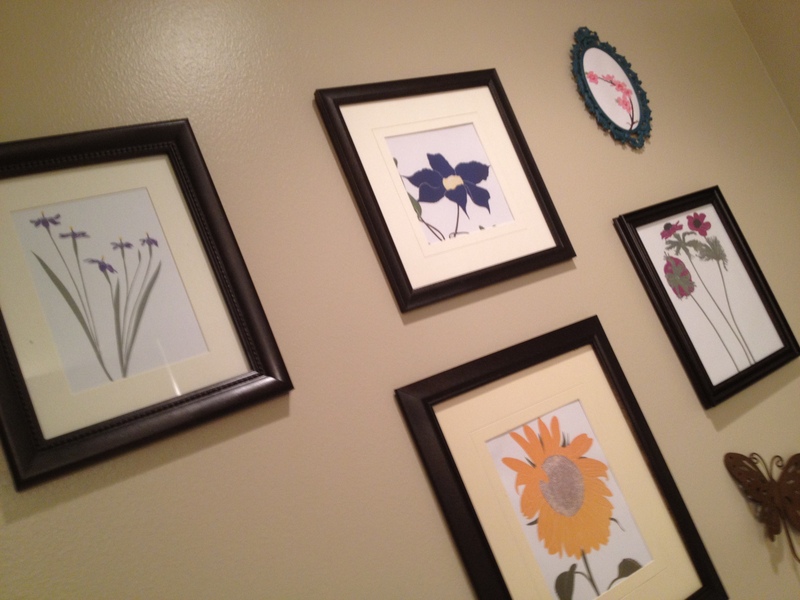 I love the interest that a little grouping of photos adds and I love the drama of a whole wall covered in frames.